We learned a lot this year; from the origins of liquimetal and toasted thighs to the technical reasoning of ISO and CDMA. 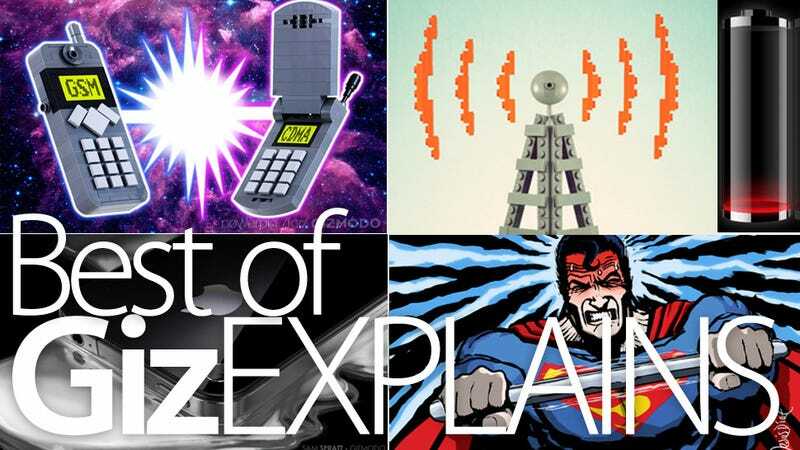 Check out the best explanations Gizmodo had to offer in 2010. This graphic shows why some people experience the iPhone 4 signal drop problems while others haven't been able to reproduce it. It also explains why Apple's incoming software update-which promises more accurate signal bars-won't fix the antenna problem. Apple has a new toy. It's a materials company called Liquidmetal, and everybody's talking! Problem is, nobody seems too sure what they're talking about. So, Liquidmetal: What is this stuff? And what does Apple want with it? The beardier parts of the web-o-sphere have been abuzz about HTML5, the next version of the language that powers our internet. Will it revolutionize web apps? Will it kill Flash video? Will it fix our gimpy iPads? Yes... and no. Adamantite! Rearden Metal! Uru! Durasteel! Dalekanium! Unobtanium! Thousands of fictional characters have fought and died for these equally fictional super-materials. So what is the real-life strongest substance on our puny, sun-warmed planet? Yesterday morning, you looked good. Yesterday evening, before you went out, you're pretty sure you looked real good. So who the hell is this schlub in the Facebook album from last night, tagged with your name? I confess: I used to bring my laptop to the toilet, placing it over my upper legs. Apparently, this is a very bad idea. It can cause Toasted Skin Syndrome-which could lead to skin cancer in some cases. Inside almost every gadget lurks a ticking time bomb. In two years, or maybe three or four, it will die, rendering your gadget useless. Possibly permanently. So, what are these awful little bastards? They're called batteries. America is divided! One faction is powerful and entrenched. The other is respected by the rest of the world, but can't seem to seize power here. I'm talking, obviously, about our cellphones. Been under a rock? See what else happened this year in our Best of 2010 series.